Study: Arctic Sea Ice Was Thinner In 1955 Than In years 2015-2017 | Watts Up With That? From the “skating on thin ice” department. In 1955, the atmospheric CO2 concentration hovered around 315 ppm, about 90 ppm lower than today’s CO2 values. It is widely assumed that the steep and substantial rise in CO2 concentration since the 1950s is largely responsible for warming the Arctic, and consequently the decline in the Arctic’s sea ice volume and extent (IPCC, 2013). This assumption is significantly predicated on the observation that sea ice has undergone precipitous losses since the 1970s, which is when the satellite era began. In recent years, sea‐ice conditions in the Arctic Ocean changed substantially toward a younger and thinner sea‐ice cover. To capture the scope of these changes and identify the differences between individual regions, in situ observations from expeditions are a valuable data source. We present a continuous time series of in situ measurements from the N‐ICE2015 expedition from January to June 2015 in the Arctic Basin north of Svalbard, comprising snow buoy and ice mass balance buoy data and local and regional data gained from electromagnetic induction (EM) surveys and snow probe measurements from four distinct drifts. The observed mean snow depth of 0.53 m for April to early June is 73% above the average value of 0.30 m from historical and recent observations in this region, covering the years 1955–2017. The modal total ice and snow thicknesses, of 1.6 and 1.7 m measured with ground‐based EM and airborne EM measurements in April, May, and June 2015, respectively, lie below the values ranging from 1.8 to 2.7 m, reported in historical observations from the same region and time of year. The thick snow cover slows thermodynamic growth of the underlying sea ice. In combination with a thin sea‐ice cover this leads to an imbalance between snow and ice thickness, which causes widespread negative freeboard with subsequent flooding and a potential for snow‐ice formation. With certainty, 29% of randomly located drill holes on level ice had negative freeboard. June 18, 2018 in Arctic. ← Anthropogenic Global Warming (AGW) a Premeditated Crime Against Science Justified with Artificial Certainty. CO2 correlates with ice coverage the same way that it does with sea-level. Sea level from the WUWT data posted a few weeks ago to say June CO2 each year is a precise linear correlation. The trend is y = 0.761x + 353.74. The correlation coefficient is 0.971, an exact match. The so-called change of trend with time is actually more noise in values less than 355 ppm. There is no change of slope in the correlation. Which tide gauge(s) are you correlating to? So now we have a new category: “Fake Equations,” as there is no tide gauge on the planet with a 100year+ record that correlates with CO2! Over what time period are you measuring? Hello, has anyone ever looked at what the temperatures were prior to the above ground nuclear testing and the effect that might have had for aerosols and other debris in the atmosphere? I have to imagine that it reflects some sunlight and would affect the temperature. I am just a novice with a question. Not sure why someone would tag this question with a “-” on the like-o-meter. It is a reasonable question to ask. There were several rather large thermo-nuclear events in the tropical Pacific that sent all kinds of stuff into the stratosphere.. as do volcanoes. I assume it had some effect on the makeup of stratosphere although how much I haven’t a clue. I’m guessing those set off over water may have a different effect than those over land. Really big volcanoes only impact climate for a few months. Much smaller nuclear explosions would have less impact. More like a couple years for big volcanoes! And while nuclear explosions are individually smaller, during the period of time of atmospheric testing, there were frequent tests over many years. I don’t think that they can be discounted out of hand. If the debris didn’t make it to the stratosphere, then they can be discounted completely. Thanks for the replies. I truly did not know and had not found any discussions. Huh? After the recent string of ‘warmest evah’ years…. and the damn arctic ice still won’t melt? Cool! Anyone else care to join me for a carbonated beverage?? In fact, June ice melt rate is lowest ever recorded. Two days until Solstice, and sea ice volume remains near peak values for the Winter. I think this is the year we will cross back into above average ice, and then go thicker from there, mostly, for 30 years. If not this year, then soon. Been awhile since any major volcano erupting…overdue I would think. Global cooling is upon us. Let’s hope it is not too bad. I think in the last week there have been a lot of volcanos “popping” and I think Hawaii could very easily be called major. Also I think the people who lost family members in pyroclastic flows would disagree with you. None of the recent volcanoes can be considered major. Only one came close to being strong enough to put aerosols into the stratosphere. Not a big aerosol generator. I’m not sure what you mean by “major volcano erupting” but all volcanoes are “major” by their nature. There are quite a few currently erupting, showing restlessness, and/or bumping up their activity. Volcanodiscovery.org has a complete list of them and where they are if you want to go visit. Sara, volcanoes are certainly classified by the frequency, type and extent of eruptions. The news/ lay media often uses the term major eruption or major volcano to describe either the extent of the eruption or the type of volcano erupting. Fifty to seventy volcanoes erupt each years, with between 60 to 80 eruptions. I don’t track volcanoes as closely as I did but that haven’t noticed any recent dramatic increase. We have had a couple of volcanoes in the Andes erupt after thousands of years being quite, again based on their estimate frequency nothing unusual. Most we don’t hear about, e.g., those erupting along the Aleutian chain. Since Kilauea has been erupting for decades most of the time it is classified as minor eruptions. Every now and then Pele decides to make a lot more land and we see the present “major” eruption taking place. I would have thought the Abstract says the snow and ice is distinctly thinner? The 1.8 to 2.7 m ranges from historical observations refer to the values from the 1970s (as shown in the graph). The 1955 thickness value reported was 0.94 m.
Clever wording to maintain the narrative. They report that recent years are “below the range” while carefully ignoring that 1955 is “even further below the range”. That said, it appears to be only that one year of data that is well below the range. The next data point isn’t until 1974. So 1955 could well be an outlier. It’s fairly clear that it’s an outlier if you look at the data in the paper. The table shown above isn’t their original, it has been edited to remove the middle part of the data. Clever editing and sentence construction can distort simple facts. Not something new, but they should try harder. The sea-ice has always varied a lot. 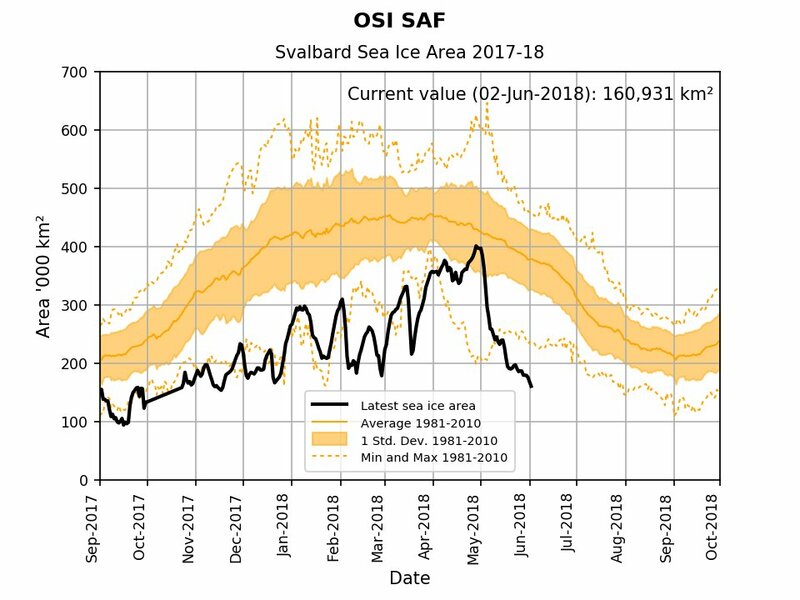 Currently there is much less sea-ice north of Svalbard than at the same time last year, but much more and thicker ice, north of the East Siberian coast. WUWT had a post, years back, that showed an early Nimbus satellite shot that revealed a surprisingly large area of open water north of Alaska in September, 1969. In the pre-satellite era Alarmists have a bad habit of “in-filling” areas where they have zero data with 100% sea-ice, when there is no real reason not to assume there were patches of open water back then, just as there are now. We have pictures from submarines which found open water to surface in back then. Also we have memoirs of servicemen who served on “Fletcher’s Ice Island” a large tabular iceberg that served as an airbase in the arctic for nearly a quarter century, 1950’s-1970’s, and those servicemen record venturing from the ice-island onto the sea-ice and being able to look down into melt-water pools “with no bottom” back in the 1950’s. Here is the old WUWT post with the Nimbus satellite picture from September, 1969. There’s a term I’ll have to look-up to even know what the hell they are saying. Negative freeboard is basically floating ice that is underwater. Notice the pressure ridge towards which the men are walking. It has positive freeboard, as the ridge is totally above the water within which it floats. Everywhere you see pools of water, the ice below it has negative freeboard, as the water is above the ice and essentially level with the ocean underneath. the height of a ship’s side between the waterline and the deck. So, for floating ice, it would be the distance from the waterline of an ice floe to the upper surface of the ice (the “deck”). Negative freeboard, a very bad thing for a boat or ship, would mean that while still “floating” (as opposed to sinking altogether) the upper surface of the ice floe would be underwater. This bit “negative freeboard with subsequent flooding and a potential for snow‐ice formation.” thus means that sea water would “flood” the snow layer atop the solid ice. If you were in a boat, it would appear that the ice floe was a normal floating ice floe but you would be seeing the snow layer above the water while the true solid ice part of the floe was actually below the sea surface. The same as Dr. Mann disappeared the MWP and LIA, it seems that others may be disappearing historical examples of thin arctic ice. The Carbon Brief site is outrageous. In another article (that they blog as if it was a scientific study) they tried to convince us that the climate models have been accurate all along. 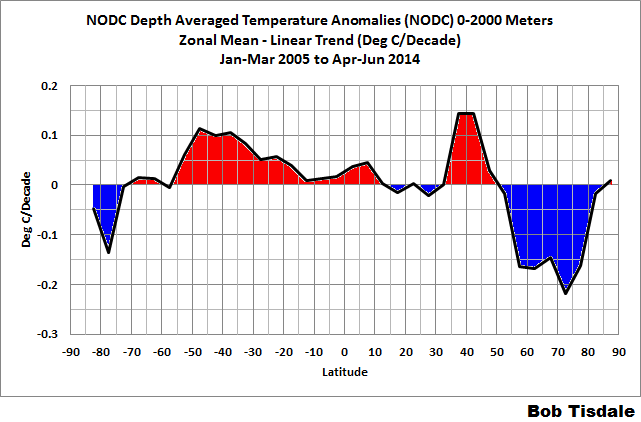 Of course they had to display fake graphs to hide any cooling and exaggerate the warming of real world observations. I noted that in the climate model article they did not use any satellite temperature data. I shudder to think how many sites are repeating the same nonsense as Carbon Brief. The winter arctic temperature is rising for 2 reasons. Firstly, more latent heat of sea ice formation is being released into the atmosphere in the early winter because older packed sea ice is slowly melting and allowing a greater area for new sea ice to form– this is leading to a cooling of the deeper arctic waters and increased contribution to the THC. Secondly, this early warmer period breaks down the polar vortex which then allows a lot more warm air into the arctic and releases more cold air out. 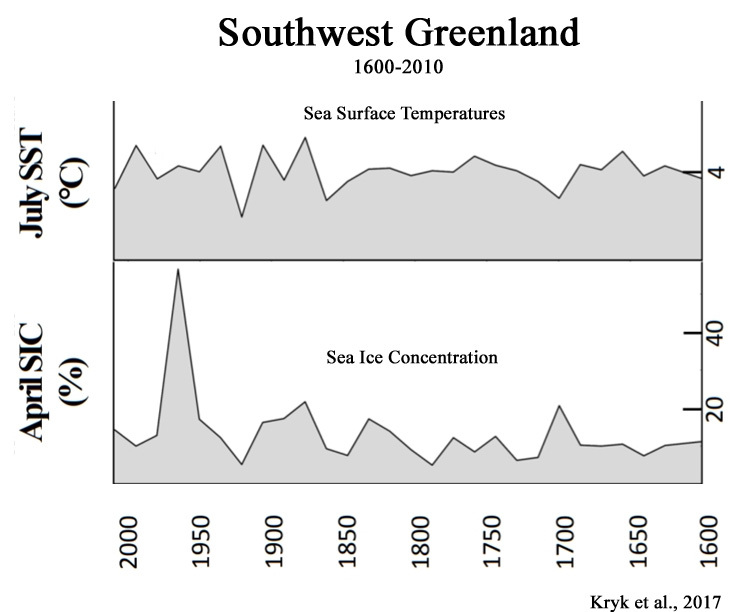 Summer temperatures are constrained by the latent heat of sea ice melt. I do hope that TOA satellites can pick up this energy loss to space at the very top of the earth. I also see the potential for an oscillation here where on a global heating phase old packed sea ice limits sea ice build, then eventually enough old ice melts to allow a bigger yearly sea ice build and consequently a phase of global cooling occurs due to increased THC and increased cloud formation. This is made possible because of the open water geography of the arctic. and end here: “and consequently a phase of global cooling occurs”. Actually zazove, I may have misinterpreted your question. Don’t forget sea ice forms much easier over open ocean than under thick pack ice due to pack ice insulating the underlying water. Bruce, this mechanism would imply that the older, thicker sea ice would leave more surface area bare after melting than the thin new ice that would subsequently form. If the areas were equal, the greater mass of old sea ice melting would absorb more heat than the thin ice freezing would emit. Have you looked for data that would support this? Hi Loren, I’ve just got up!- nz time. Towards the end of a warming phase (now) a larger area of arctic ocean is exposed by the end of summer and we see a rapid refreeze as winter arrives, see here. How about the entire 1940 to 1960 period? We need more than one year. Until the takeover (by the global alarmists) of the geology, paleontology, and archaeology faculties of the world universities is complete; their world only started in approximately 1979. Data before that is either to be ignored, homogenized, or wiped out. Don’t forget that they have already taken over the atmospheric science faculties all over the world and of course they invented the climate science faculties. Usually they aren’t called that; so that it is easier to corrupt the related sciences like geo science, earth science, environmental science………………………ad infinitum. We could go on forever with bastardized faculty names around the world. I have noted that it is possible to get both a Master degree in Climate Science and a PhD in Climate Science. Current thickness and volume of sea ice in the Arctic. The daily DMI sea ice volume gap between 2018’and the next higher year, 2005, is continuing to narrow, as is the gap between 2014 and this year. I have a photo showing two US submarines (Seadragon and Skate ?) taken at the North Pole in August 1962 in what is very clearly pretty much open water. I would upload it if I knew how but presumably it’s still on the internet somewhere. We know this from the Skate and the nautilus missions of the 1950s. 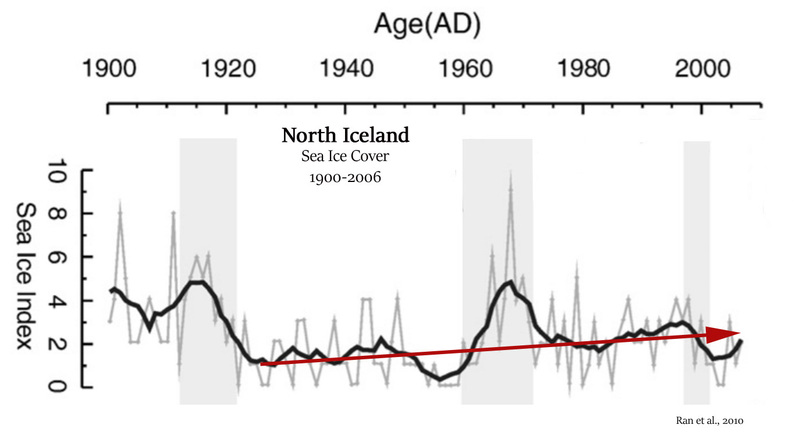 Also Hadcrut (for the arctic region) shows the 1920s to 1940s considerably warmer than today. So passes yet another fundamental tenet of the religion of carbon dioxide. Cannot wait for the CO2 ‘splainin as to how thickening Arctic ice is caused by the devil gas. It’s very simple, CephusO: CO2 is a solid when it is frozen, as you know, but when the atmosphere reaches a certain temperature level, CO2 evaporates or sublimes from a solid state to a gaseous state. As it is obviously mixed in as a major part of the ice covering the northern polar region (Arctic) and helps the ice sheet thicken that way, when the proper temperature is reached, and CO2 vapes into vapor, the water ice remaining thins out. And if you believe it, you’re sillier than whatshispudgyface. But he would likely seize on that and use it to ‘splain Arctic ice thickening and thinning. You have real talent for ‘climate change’ creative writing! Looks to me like they are citing Romanov (1996). I have not seen the paper. Facts are irrelevant to global warming pushers. Rationalization is all. There are plenty of pictures floating around the internet of navy ships at the geographic north pole in the 1950’s with nary an ice-floe in sight. By 1955 it was thickening from even thinner in the 1930s, the real modern warm period. The Cold Regions Research and Engineering Laboratory (CRREL; Hanover, NH) might be a possible source of historical information for the Arctic. I was stationed there while in the Army, and spent the month of April (1967) at Pt. Barrow, participating in a joint experiment with NASA, obtaining ground-truth of ice thickness and temperatures for a passive microwave imaging overflight of the ice. CRREL and its forerunner, SIPRE, was involved with lots of Arctic research for which field notes recorded environmental conditions. Good job they didn’t publish it this year as the thickness is zero this year. It wasn’t zero in April, when the 1955 reading was taken. 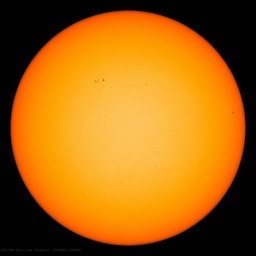 Oh yes, that was part of another AMO peak period along with or among an intense solar cycle group. No one lives or dies on how much Arctic sea ice there is. Or isn’t. In the late 1950s the ice was about 2 metres thick, that is about the same thickness as seen today. Of course, it was the 1920s to 1940s that was the warmest period as is recorded in HADCRUT.